A twin‐screw extruder synthesized the high-density polyethylene (HDPE)/corn flour (CF) composites. The properties of different contents of CF (10, 20, 25wt. %) has been evaluated and analyzed in detail, including the mechanical, thermal, and physical properties. Results exhibited the high interfacial adhesion between HDPE and CF. The tensile strength of HDPE composites with higher loading 25%CF showed tensile strength which was 37% higher than the neat HDPE. Similarly, modulus of elasticity and flexural strength parameters increased by the ratios 0.5% and 14% respectively, however, impact strength decreased by the ratio 48%. Results also showed that thermal conductivity is improved and it reduced by 42% with a higher amount of CF (25%Wt). Water absorbance increased with increasing CF in HDPE matrix. 1. Awad SA and Khalaf EM. Evaluation of thermal and mechanical properties of lowdensity Poly Ethylene (LDPE)-Corn Flour (CF) composites. Journal of ChemTech Research, 2017;10(13):230-235. 2. Awad SA and Khalaf EM. Improvement chemical, thermal, and mechanical properties of Polypropylene by using corn flour. Usak University Journal of Material Sciences, 2017; 6(1/2):15-25. 3. Blaszczak P, Brostow W, Datashvili T and Lobland HEH. Rheology of low‐density polyethylene+ Boehmite composites. Polymer composites 2010, 31(11):1909-1913. 4. Myers G, Chahyadi I, Gonzalez C, Coberly C, and Ermer D. Wood flour and polypropylene or high-density polyethylene composites: Influence of maleated polypropylene concentration and extrusion temperature on properties. International Journal of Polymeric Materials, 1991;15(3-4):171-186. 5. Karmarkar A, Chauhan S, Modak JM and Chanda M. Mechanical properties of wood– fiber reinforced polypropylene composites: Effect of a novel compatibilizer with isocyanate functional group. Composites Part A: Applied Science and Manufacturing; 2007; 38(2):227-233. 6. Camacho W and Karlsson S. Assessment of thermal and thermo-oxidative stability of multi-extruded recycled PP, HDPE and a blend thereof. Polymer degradation and stability, 2002;78(2):385-391. 7. Fan J and Xu S. Aluminum oxide particles/silicon carbide whiskers’ synergistic effect on thermal conductivity of high-density polyethylene composites. Iranian Polymer Journal, 2018;27:339-347. 8. Jeziórska R, Zielecka M, Gutarowska B and Żakowska Z. High-density polyethylene composites filled with nanosilica containing immobilized nanosilver or nanocopper: thermal, mechanical, and bactericidal properties and morphology and interphase characterization. International Journal of Polymer Science, 2014; 14: 1-13. 9. Li Y, Hu C and Yu Y. Interfacial studies of sisal fiber reinforced high-density polyethylene (HDPE) composites. Composites Part A: Applied Science and Manufacturing, 2008; 39(4):570-578. 10. Luz S, Gonçalves A and Del’Arco Jr A. Mechanical behavior and microstructural analysis of sugarcane bagasse fibers reinforced polypropylene composites. Composites Part A: applied science and manufacturing, 2007;38(6):1455-1461. 11. Madhu G, Bhunia H, Bajpai PK and Chaudhary V. Mechanical and morphological properties of high-density polyethylene and polylactide blends. Journal of Polymer Engineering, 2014;34(9):813-821. 12. Mourad A-H, Bekheet N, El-Butch A, Abdel-Latif L, Nafee D and Barton D. The effects of process parameters on the mechanical properties of die drawn polypropylene. Polymer Testing, 2005; 24(2):169-180. 13. Mourad A-HI. Thermo-mechanical characteristics of thermally aged polyethylene/polypropylene blends. Materials & Design, 2010; 31(2):918-929. 14. Mulinari DR, Voorwald HJ, Cioffi MOH, Rocha GJ and Da Silva MLCP. Surface modification of sugarcane bagasse cellulose and its effect on mechanical and water absorption properties of sugarcane bagasse cellulose/HDPE composites. BioResources, 2010; 5(2):661-671. 15. Souza PS, Rodrigues EF, Prêta JMC, Goulart SAS and Mulinari DR. Mechanical properties of HDPE/textile fibers composites. Procedia Engineering, 2011; 10:2040-2045. 16. Khalaf EM and Awad SA. Improvement of chemical and thermal properties of polyethylene terephthalate (PET) by using multi-walled carbon nanotubes (MWCNTs). International Journal of Materials Science and Applications. 2016; 5(6): 297-301. 17. Tong JY, Royan NRR, Ng YC, Ghani A, Hafizuddin M and Ahmad S. Study of the mechanical and morphology properties of recycled HDPE composite using rice husk filler. Advances in Materials Science and Engineering, 2014; 3:1-6. 18. Awad SA, Fellows CM, Mahini SS. Effects of accelerated weathering on the chemical, mechanical, thermal and morphological properties of an epoxy/multi-walled carbon nanotube composite. Polymer Testing 2018;66:70-77. 19. Zhang Q, Cai H, Ren X, Kong L, Liu J and Jiang X. The dynamic mechanical analysis of highly filled rice husk biochar/high-density polyethylene composites. Polymers, 2017; 9(11):628-637. 20. Khalaf E and Awad S. Improvement of mechanical and water absorbance properties of low-density polyethylene (LDPE) by using white kaolin powder (WK). Journal of Advanced Chemical Sciences, 2017; 3(1):426-427. 21. Zou Y, Feng Y, Wang L and Liu X. Processing and properties of MWNT/HDPE composites. Carbon, 2004; 42(2):271-277. 22. Awad SA and Khalaf EM. Improvement of the chemical, thermal, mechanical and morphological properties of polyethylene terephthalate–graphene particle composites. Bulletin of Materials Science, 2018; 41(3):67-72. 23. Awad SA, Fellows CM, Saeed Mahini S. A comparative study of accelerated weathering of epoxy resins based on DGEBA and HDGEBA. Journal of Polymer Research 2018;25:103-110. 24. Hristov V and Vlachopoulos J. A study of viscoelasticity and extrudate distortions of wood polymer composites. Rheologica Acta, 2007;46(5):773-783. ISNAD Awad, Sameer , Khalaf, Eman . "MODIFIED PERFORMANCE OF MECHANICAL, THERMAL, AND PHYSICAL PROPERTIES OF HIGH-DENSITY POLYETHYLENE – CORN FLOUR COMPOSITES". 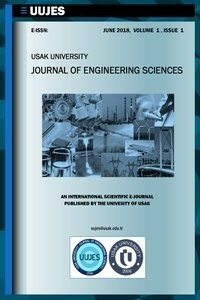 Usak University Journal of Engineering Sciences 1 / 1 (June 2018): 38-46.